Key difference: Chow mein and Hakka noodles are both Chinese dishes. The difference between them is the style in which they are cooked. 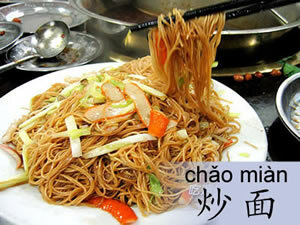 Chow mein has a Taishan influence to it, while Hakka noodles are cooked as per the Hakka cuisine. Chow mein and Hakka noodles are both noodle dishes of China. In order to differentiate between these two recipes, one has to delve into the ancestry and origin of the communities that these foods belong to. Chow mein, actually Chao mian in Mandarin, is a product of the Taishanese community of China. Taishan is a coastal county-level city in the southern Guangdong province of the People's Republic of China. The city is part of the Greater Taishan Region, and the people who live here are known as the Taishanese. The Chow mein is a noodle dish cooked in the style prescribed by the ancient Taishanese, or the people living in the modern day Taishan regions of China. 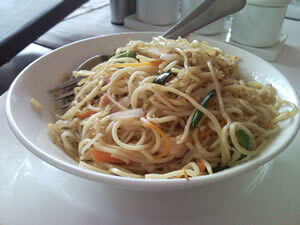 Hakka noodles refers to the style of preparation of noodles by the Hakka Chinese. These people are also known as Hakka Han, or the Han Chinese, who are related to the provincial areas of Guangdong, Jiangxi, Guangxi, Sichuan, Hunan and Fujian in China. A majority of these people migrated to various parts of the world centuries ago, among which India is a prominent destination that they headed to. In India, the Hakka Chinese settled in Tangra, Kolkata, which comes to be known as the Chinatown of India. The amalgamation of local Bengali cuisine of Kolkata and the Hakka Chinese cooking style gave birth to what we know as 'Hakka noodles' today. While Hakka noodles is ancestrally known to be unlike Chow mein, they both are called and understood as the same by many people in India and the rest of the world. A big reason for this to happen is that both dishes are prepared by first cooking them in water or broth, and then draining it. Moreover, the kind of vegetables and dressing used in these dishes are also the same. The sauces used in preparation aren’t too different either. Vinegar, soya, chilli, etc. are all added, or can be added in both these dishes. Basically, these two are open ended recipes, i.e. one can cook them according to the raw materials available at hand, or as per one’s specific requirements. However, if one were to point out the trifle differences between them, preparation would again be the biggest difference. Hakka noodles are toss-fried and have a distinct Indo-Chinese flavor to them, whereas Chow mein is a stir-fried noodle dish having an original flavor, besides being influenced by a variety of cuisines. In fact, American Chinese, Brazilian Chinese, Mexican Chinese cuisines have their own versions of the Chow mein. So, it’s actually very difficult to pinpoint the differences between Chow mein and Hakka noodles, but if one can do so, he/she probably deserves a noodle treat! Mostly had dry, gravy in combination with Hakka noodles is a rarity.